The study of parks is currently a dynamic field in landscape history. Research has demonstrated that Suffolk has a high proportion of the parks in the Domesday survey, that they form an important part of Suffolk’s medieval landscape (being present from at least the late 11th century, and in large numbers by the early 13th century), and that we need to re-examine the chronology of imparking. We begin with an exploration of the documents, literature and images which illustrate hunting and park creation during the medieval period. We shall then focus on the Suffolk parks mentioned in the 1086 Domesday Survey (Leiston, Dennington, Bentley, Eye and Ixworth), and consider ownership, reasons for inclusion, location and subsequent development. Finally we shall look at the question of the possible under-recording of parks in Domesday Book - were there more parks at the time and could some of them have been Anglo-Saxon in origin? 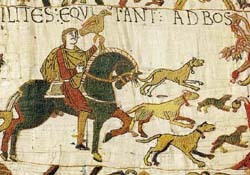 10.15 Hunting and parks in the medieval period - Through an examination of the evidence for hunting we shall look at the significance of hunting in medieval society. Similarly we will explore the evidence for the creation of parks, their place in the manorial economy, and their legacy in the landscape. 11.30 Suffolk’s Domesday parks I - Following a brief consideration of the purpose of the Domesday Survey and how parks were recorded, we shall focus on two of Suffolk’s five Domesday parks in terms of ownership, location and subsequent development. 15:15 Issues of pre-Conquest (Anglo-Saxon) parks in Suffolk- A look at the evidence for hunting during the Anglo-Saxon period. We shall focus on two questions – were there parks in Suffolk which were not recorded by the Domesday survey and were there parks in pre-Conquest Suffolk? Since completing her first degree in Geography and Archaeology in which she specialised in historical geography and British archaeology of the Roman and medieval period, Rosemary has pursued a career teaching Geography. Alongside this, as well as continuing her academic study, she has been active in promoting history and archaeology to the public via her previous roles as curator to Woodbridge Museum and as chairman of the Sutton Hoo Society. Her main interests lie in landscape development, and she has worked specifically on medieval moated sites, dovecotes, rabbit warrens and parks, contributing entries to the Suffolk Historical Atlas on both warrens and parks. She completed her PhD on Suffolk Parks from the 11th to the 17th centuries in 1992, and more recently she has been investigating the Domesday parks of Suffolk in more detail both via documentary sources and via fieldwork.